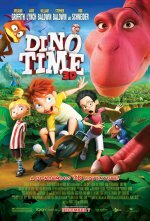 Three kids who travel back in time to 65 million years ago, where they are taken in by a dinosaur! There’s nothing Ernie loves more than an excellent adventure, whether he’s zooming around town on his rocket-powered skateboard or stealing an early peek at the coolest new fossil exhibit at the Dinosaur Museum. It’s not always easy under the strict rule of his mom Sue (Jane Lynch) - especially with his sister Julia following him around and trying to get him into trouble every chance she gets - bu t he still manages to stir up some fun. One day, however, Ernie’s daredevil nature takes him on a journey with potentially irreversible consequences. After sneaking over to his best friend Max’s house, Ernie discovers Max’s dad’s latest invention: a sleek, egg-shaped time machine. Suddenly, Julia bursts in to bust the two boys, and in the ensuing chaos, the time machine whirs to life and closes its doors on the three arguing kids. 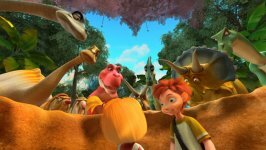 When the hydraulic doors hiss open, the kids find themselves in a lush jungle untouched by mankind, with a living, breathing T-Rex named Tyra (Melanie Griffith) standing over them. Tyra nuzzles them softly, and Ernie realizes that they’re not going to end up dinosaur food – they’re family! 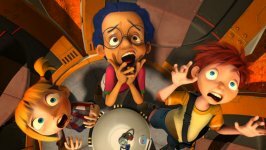 The egg-shaped time machine has landed in Tyra’s nest, and the she thinks the human children are hers, new siblings to her hyperactive dinosaur son Dodger (Rob Schneider).